An Annual Report details the year’s activities, including program highlights, financial reports, and a message from our abbess. It gives us a chance to share the Abbey’s Dharma activities and to rejoice in the merit of the benefactors who help make everything happen. Below, founder and abbess Ven. Chodron gives an overview of the year. See the annual report web version to view 2018 highlights: info on teachings, outreach, and lots of photos. To receive the full report, including financial details and list of benefactors, write the office. His Holiness the Dalai Lama advises us to become 21st Century Buddhists. He wants us to be well educated in the Dharma and to use reasoning to examine the Buddha’s teachings and to practice them, not out of blind faith, but with informed conviction. His Holiness wants us to apply the teaching to our lives in order to subdue our own minds as well as to help ease the suffering around us. We follow this guidance every day at Sravasti Abbey. With your support and participation, we learn, practice, and share the Buddhadharma to create peace in a chaotic world. Worldwide, it seems 2018 was even more chaotic than the year before, and the Abbey responded. We had a full year! The year began with an historic event. For nearly three weeks, we hosted 49 nuns from three Buddhist traditions as we studied the Vinaya, the Buddha’s guidelines for monastics. Venerable Bhikshuni Master Wuyin, founder and abbess of one of Taiwan’s most respected Buddhist organizations, Luminary International Buddhist Society, brought six of her nuns to assist her in teaching nuns living in the West. Master Wuyin was pleased to see how the Abbey community lives, and she has joined our advisory board. 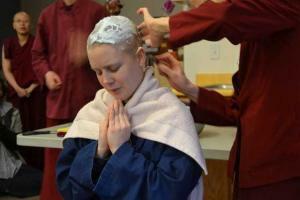 During the course, the Abbey community gave ordination to Rebecca Bradley, now Ven. Thubten Lamsel. As far as we know, it was the first ever such ordination in our particular Vinaya lineage (Dharmaguptaka) given by an all-Western sangha. A source of many joyful tears, the ordination takes us closer to our cherished dream of offering full ordination at Sravasti Abbey someday. Over forty phenomenal lay volunteers helped to make the Vinaya course possible. The whole course beautifully exemplified the interdependence of the lay and monastic communities! Our roster of guest teachers was especially rich in 2018. We welcomed teachings from the 7th Kyabje Ling Rinpoche, professor emeritus Geshe Yeshe Thabkye, Geshe Dadul Namgyal from the Drepung Loseling Institute and the Emory-Tibet Science Initiative, and senior bhikshuni Ven. Sangye Khadro, in addition to our ongoing course with professor emeritus Jeffrey Hopkins. Kyabje Ling Rinpoche’s visit was another historic event. He is the reincarnation of His Holiness the Dalai Lama’s senior tutor, who was also my ordination preceptor in 1977. Rinpoche has followed the Abbey from afar for a long time, and he was very pleased with his visit. We loved showing him the buildings and property, and his profound one-day teaching drew over 100 people. 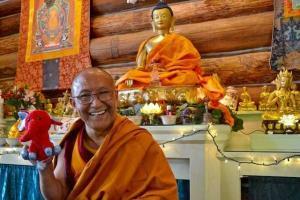 Geshe Thabkhe gave eight days of teachings on Dharmakirti’s Pramanavarttika, anessential text on reasoning.Geshe Rinpoche is one of the last generation of masters extensively trained in old Tibet. At 88, travel is not easy for him, so he teaches via Skype from the Tibetan Buddhist Learning Center in New Jersey. Like all Abbey teachings, the Pramanavarttikatalks are offered freely on our YouTube channel. I’m astonished that the channel—which contains our Bodhisattvas Breakfast Corner talks, plus weekly and retreat teachings—drew over half a million views last year! A highlight for me personally was Wisdom Publication’s release of The Foundation of Buddhist Practice,the second volume in the series I am editing and co-writing with His Holiness the Dalai Lama in The Library of Wisdom and Compassion. (By the time you read this, Volume 3, Samsara, Nirvana, and Buddha Nature, will be out too.) Our community has made this series our top priority, and the project will take much of my attention for a few more years. 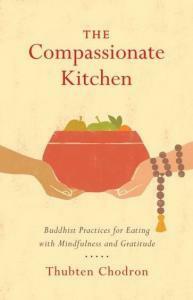 Another book,The Compassionate Kitchen, came out in December. If you have visited the Abbey, you’ll recognize the rites and recitations that are included. The book describes ways that anyone—families, couples, singles, and Buddhist monastics—can transform the activities associated with food into spiritual practice. The Abbey had a full schedule of residential programs, and Abbey monastics traveled to give teachings in North America, Europe, and Asia. I particularly enjoyed teaching in Indonesia where we also explored some of the ancient Buddhist ruins at Muara Jambi where Lama Atisha studied bodhicitta with his Master Serlingpa. I also value the Russians’ enthusiastic effort to spread the Dharma in their country, and am happy to teach there. Of course, returning to Singapore each year is like visiting home. The turnout for Ling Rinpoche’s teaching, along with the 50-plus attendance at our three biggest weekend retreats, has pushed us to begin planning for the long-anticipated temple. Stay tuned! The chief way the Abbey makes a difference is by offering the Buddha’s teachings— online, in books and articles, and by freely offering our programs. People write regularly to say how much the Dharma they receive from the Abbey has made a difference in their lives. This is possible through your kind support. Another aspect to 21st Century Buddhism is speaking up and taking compassionate action. In 2018, the Abbey had many such opportunities. 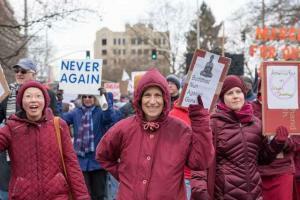 Four nuns came out of retreat to join Spokane’s March for Our Lives, a call to end school shootings and curb the epidemic of gun violence in America. A few months later we stood with an interfaith coalition in a candlelight vigil at our local synagogue to mourn the killings in a Pittsburg temple. In between, we attended workshops—like Why Race Matters and Applied Suicide Intervention Skills Training (ASIST)—to deepern our understanding. We spoke on panels, at churches, and in classrooms to share the Buddha’s teachings on compassion and non-violence. We joined with environmental and other groups to actively oppose construction of a silicon smelter in nearby Newport.And, of course, we sustain our prison Dharma outreach and efforts to help homeless teens. While we’re very public with our Dharma offerings, the Abbey does a lot behind the scenes to keep everything running smoothly. 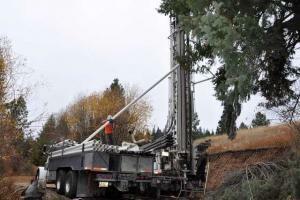 Last year we dug a new well, spent many hours maintaining our present buildings and infrastructure, and worked in the forest to minimize the threat of forest fire. We are conscientious in our efforts to preserve the resources you generously provide. 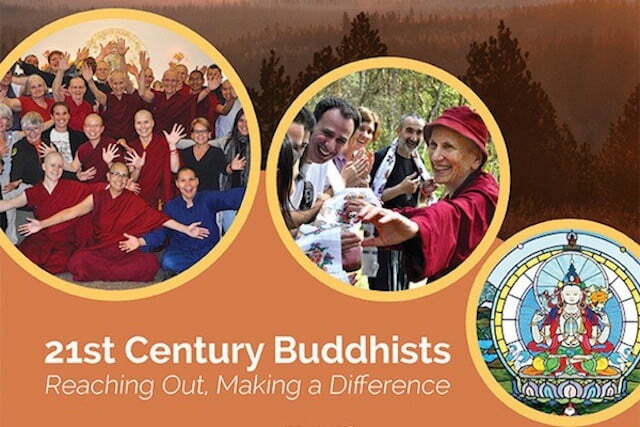 All of these activities support our mission, which can be summarized in four points: support a flourishing monastic community, root the Buddha’s teachings in the West, preserve the Dharma, and serve sentient beings for as long as space endures. We are grateful for your partnership in reaching out and making a difference in creating peace in our chaotic world! Thank you.